Will segregated bike lanes prevent lorry deaths? As I mentioned on twitter, on Monday 23rd February it will be 11 years since the death of Sebastian Lukomski, who was killed whilst working in London as a bicycle messenger by a left-turning lorry. As 8 of the 9 London bicycle messengers known to have been killed whilst working died as the result of being run over by lorries, I have studied the hazards from to lorries to London cyclists over a number years, and campaigned for changes, notably by asking for a daytime ban on lorries in London after Seb’s death when I was chair of the London Bicycle Messenger Association. 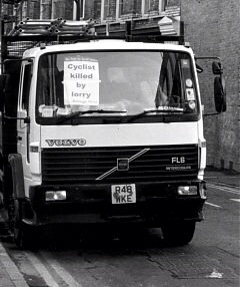 4 people have been killed whilst cycling in London so far this year, all of whom were run over by lorries (HGVs). In an average year, between 10 & 15 people will be killed whilst cycling in London. I reckon that these numbers are about as low as they have been at any time since the invention of the bicycle, and are certainly as low as at any time since I started cycling in London, over 40 years ago. The overwhelming majority of these deaths will be as the result of being run over by a lorry, which is highly likely to be working for the building trade. Frequently, the collision will happen at a junction, at which the lorry will be turning left, as in fact seems to be the case with all 4 fatalities so far this year. The deaths have led to renewal of calls for a large scale network of segregated bicycle lanes, of the Dutch or Danish design, with Donnachadh McCarthy of Stop Killing Cyclists, organisers of ‘Die-Ins’and other actions, prominent. I think it’s worth pointing out that segregated bike lanes alone will not prevent these types of collisions, and that segregation in space only is arguably likely to cause more rather than less of these types (left turning lorry runs over cyclist proceeding straight on or also turning left) of highly dangerous collisions. This may seem counter-intuitive, but in my view, any situation where cyclists and lorries are stationary at a junction with the cyclist to the left, or, worse, with the cyclist slight ahead & to the left of the lorry, and then move away from the junction at the same time will lead to potentially deadly conflicts. Likewise, anytime you have cyclists on the left of lorries on the approach to a left-turn, there is the potential for collision, if the lorry is turning left across the path of the cyclists. A considerable amount of work has been done to alert both cyclists and lorries to the potential dangers of left-turning lorries to cyclists, including legislating to make the fitting of the so-called ‘4th mirror’ to lorries compulsory, the Changing Places initiative, which encouraged cyclists to sit behind the wheel of a lorry, in order to demonstrate how difficult it is for drivers to see objects alongside and just in front on the left of the vehicle. The solution to the problem of bikes and lorries pulling away from lights together is, of course, to separate in time as well as space, by giving bikes their own traffic light phase, such as the lights at the junction of Agar Grove and St Pancras Way. 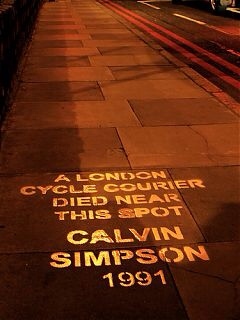 These were installed after Conrad DuToit was killed by a lorry, whilst using the segregated bike lane. The problem of lorries turning left across segregated bike lanes is a little more difficult to solve. High cab lorries are inherently unsafe, even with mirrors and cameras. At last year’s debate on sentencing in road crime cases, we were told that to check all the mirrors from behind the wheel of a high cab lorry takes several seconds, which is an eternity when manoeuvring a lorry in traffic in London, and despite apparently being fitted with all the latest safety features, including cameras, a lorry ran over and killed Claire Hitier-Abadie, the 4th person to have been killed whilst cycling in London by a lorry so far this year. I doubt that the provision of properly separated bike lane will solve the problem. Right hooks by lorries across cyclists are a problem in Denmark and the Netherlands, and are recognised as such by the authorities there. I am sure that building a decent network of segregated bike lanes in London will lead to an increase in people cycling, and that this is in itself is reason to do it – it is pretty clear that the much heralded cycling boom of the noughties has levelled off, and without investment in infrastructure, cycling rates in London will remain were they are – popular with a particular demographic i.e. young, affluent professionals, but not with the average shopper or commuter. However, in my opinion, the only way to dramatically reduce the numbers of people killed whilst cycling inLondon by lorries is by completely segregating bikes from high-cab lorries, that is, ban high-cab lorries altogether from London. The London Cycling Campaign has challenged the construction industry to adopt its safer lorry design, but without legislation, I can’t imagine a big take-up. As the economists say, at the moment the construction industry is able to impose a large externality, i.e. serious injury or death of pedestrians and cyclists, on society which we are forced to absorb. The costs of road traffic injury and death are great – whether you are considering the human, social or economic implications of the death of a mother, colleague and wife such as Claire Hitier-Abadie. I have absolutely no doubt the costs of these deaths and injuries far exceeds the cost of re-equipping the lorry fleet. Why should the construction and building industry evade these costs completely? I see no reason to change my mind about a ban on high-cab lorries in London. This is written question from London Assembly Member Darren Johnson to the London Mayor Boris Johnson with the Mayor’s reply below. I am pretty shocked by this, as London buses have direct vision cabs, which I had always considered much safer than traditional ‘high-cab’ lorries, as they do not have the same problems with seeing cyclists (or pedestrians) to their left front, and so had assumed that the bus / cyclist KSI numbers must be much better. How wrong I was to make this assumption. If these numbers are right, then there is something very, very wrong on London’s roads, especially given that we have always been presented the bus lane as the next best thing to a ‘proper’ segregated bike lane. Tom Kearney has been making a fuss about what he considers negligent behaviour by London bus companies for some considerable time now. I guess I should have been paying more attention. Are you aware that since you became Mayor there are some years when the number of cyclists killed or suffering major injury per bus km travelled is greater than the number of killed or seriously injured per HGV km travelled? Given your direct control over how London buses perform, will you include reducing casualties as part of the bus contracts? I am strongly committed to ensuring the safety of cyclists and other vulnerable roads users when sharing the road with London’s buses. I recently published my Road Safety Action Plan: Safe Streets for London. This sets an ambitious target of a 40 per cent reduction in killed and seriously injured (KSI) casualties by 2020. This covers all road traffic KSI casualties, including those involving buses and coaches. TfL has an on-going programme of measures to reduce the number of collisions involving buses. This includes training and advice for bus drivers and cyclists, improvements to junction design and infrastructure, route risk assessments and a comprehensive incident reporting system. London’s bus drivers are trained to consider the safety of cyclists through the bus driver BTEC module on cyclists and other vulnerable road users. TfL and bus operators work together to increase drivers’ awareness of cyclists, how they use the road and their vulnerability, through such initiatives as the Big Red Book, the ‘Big Bus Little Bike’ DVD and Exchanging Places events at bus garages. Bus route risk assessments are undertaken on every bus route and cycle initiatives, including new cycle infrastructure, are explained to bus operators to make sure they understand how to use them safely. Bi-annual audits are conducted to ensure the risk assessment process is thorough and relevant and all serious bus collision incidents are reviewed collaboratively with the MPS Collision Investigation Unit. Furthermore, TfL will continue to examine collision statistics and police collision investigation reports to ensure measures are deployed where they can most effectively improve safety. Dr Robert Davis, possessor of a brain the size of Zone 1, writer of a seminal work of the hazards of motor traffic, and the twisted thinking of “road safety” professionals, entitled “Death On The Streets”, explains the implications of the evidence from New Zealand, where helmets are compulsory for cyclists. A report from Transport for London's 'Safety and Sustainability Panel' on 'Cycle Safety' was published last week. In the backwards world of road traffic speak, the 'Safety' in the title actually refers to fatal danger from lorries (Heavy Goods Vehicles, also known as Large Goods Vehicle) to people cycling. I would have missed it, had I not seen a tweet from Boriswatch: “next time Boris tries to pretend [London Assembly Member] Jenny Jones is just being silly about rates of cycling KSIs, that paper suggests TfL believe her.” This is a reference to claims that Jenny Jones made last year that the risk of injury & death whilst cycling in London had gone up under Mayor Boris Johnson's tenure. These claims were disputed by the Mayor at the time. I would recommend that every London MP is sent a copy, or is emailed link to the report. There isn't a lot in it that is new in terms of numbers collated or trends identified, but the report is an excellent primer for anyone that isn't familiar with the topic. I don't want to reproduce too much here, as the report is relatively short, and can be read in a few minutes, unlike more technical reports. I tweeted a couple of the salient statistics, HGV making up 6% of traffic during the morning peak, and 5% during the rest of the day, yet were involved in 53% of cycle fatalities between 2008 & 2012. These numbers won't surprise anyone who has even a passing acquaintance with the statistics on cycling fatalities in London. HGVs were identified as the number one danger to London's cyclists nearly 20 years ago, in a British Medical Journal report that I have been linking to for at least 8 years. Also not new is the identification in the report of lorries working for builders, mainly skip or tipper lorries, being more likely than other lorries to kill cyclists. 7 out of 9 fatalities in 2011, where the collision was between a large goods vehicle and a cyclist, involved a construction lorry. In 2004 the HGV working group set up by the Mayor of London's office identified construction lorries as over-represented in cyclist fatalities. This research identified a systemic failing in road safety cultures within the construction sector, a lack of ownership of road risk throughout the supply chain and an imbalance between work place safety and road safety. I was a little bit disappointed to find that a conditional ban on HGVs was way down the same list at 'g' or 7. At least it's on the list for urgent attention. On the other hand, I take the fact that enforcement is right at the top of the list as an indication that, as I have said before, the construction hauliers do not regard compliance with regulations as anything like as important as they should do. The rules & regulations, after all, are there to keep road haulage operations safe for other road users like children, old people, people cycling, people walking, as well as people driving other motor vehicles. I understand the pressures that the hauliers are under. I have worked in the transport sector most of my adult life. I know the margins are low, that there is constant pressure from customers to shave time & money, and that everywhere you turn someone is trying to fine you for something or other. However, Operation Mermaid, which is run by the Vehicle Operator Services Agency and police forces all over the U.K. and is virtually a random road-side MOT for HGVs, routinely show contravention rates of over 50%, which shows that there are a lot of illegal lorries out on the road. I have some sympathy with the drivers. I am sure, as The Lorry Lawyer says, that no driver sets out to kill someone. However, the hauliers keep droning on about how professional they are, and blaming cyclists for not being sufficiently trained, or not wearing helmets etc etc. The evidence from Operation Mermaid, which has been going on for years and years, suggests that hauliers routinely send out onto the roads vehicles which are not compliant with current legislation. Is this pattern of behaviour, of sending out poorly managed heavy machinery to interact with the public, consistent with claims of professionalism? Obviously, I don't think so. I would suggest that, along with greater levels of enforcement, a strategy of making the hauliers employers take responsibility for their contractor's safety record has been shown to be fruitful, taking as an example the Olympic site in east London, during the construction of which the danger from the lorries going to and from the site was taken very seriously by the builders. At the end of the report there is a section on the Construction Logistics and Cycle Safety Project. The principle aim appears to be to get the construction industry to accept that the high cab tipper lorry is not fit to be driven around London, and to buy a design of tipper lorry which doesn't have any blind-spots at the front, rather like a conventional bus or a modern design of refuse lorry. Yes, we know it will be expensive to replace the current fleet of tipper lorries. It will be very, very expensive. But how much does it cost when someone is killed or seriously injured by a lorry whilst cycling? I don't know, I'd be interested to see some estimates, but I bet it's a lot more than the cost of a new tipper lorry. In closing, I don't want to overplay the dangers of riding a bike in London. If you cycle regularly, even in London, all the evidence that you will live longer than someone who does not cycle, even if you don't wear a helmet, hi-visibility clothing, and you sport high-heels and use a set of noise-cancelling head-phones playing Public Enemy's back catalogue. Cycling in London can be unpleasant, very occasionally wet & cold, but fatal & serious injuries are rare. British Cycling have been annoying me for the last couple of months. First, they invented a new version of the empty phrase cycle-friendly or (apologies to the guys at the Times, who have done great work) cycle-safe. The BC approved version is 'cycle-proofing'. It's supposed to mean making roads safe for cyclists to use. Using a non-specific suffix such as -friendly or -proofing generally doesn't signify anything apart from good intentions. Sometimes, as in the case of Google Maps beta bicycle thing, it can be seriously misleading, as Gmaps appear to be using the prescence of a marked bike or bus lane as an indication that the road in question is suitable for cyclists, meaning that Upper and Lower Thames Street were designated cycle-friendly. Likewise, I think cycle-proofing sounds like bike-wash, the cycle advocacy equivalent of green-wash. You see? It's so easy to make up meaningless but interesting-sounding labels. I don't understand why British Cycling doesn't call a spade a spade and say exactly what it means. If BC is in favour of protected bicycle lanes, 2 phase traffic lights at junctions and so forth why not say exactly that? Surely BC doesn't think that Advanced Stop Lines and other painted surfaces are anything except an awkward and unsafe halfway house? Why not use a widely accepted shorthand that encapsulates the whole protected lane, re-engineered junction package like 'Go Dutch' or 'Space For Cycling'? Why reinvent the wheel, thus muddying the advocacy waters? Suspicious and cynical cyclists like myself might be tempted to see this as a turf grab by BC, keen to expand into new areas now that the Olympic tap is no longer spouting money with the same force as before. Then I read BC's 2 year old report on the cycling economy: 'Gross Cycling Product', trumpeted by BC as the first attempt to quantify the contribution of cycling to the wealth of the nation. Guess what? Deliveries by bicycle (or tricycle) feature absolutely nowhere. It's as if the writers of the report have never been to central London, or, indeed, any major city anywhere in the world. I'm not going to suggest that couriers and other bicycle delivery people are a huge source of income for the national purse, but I would suggest that they are far from insignificant. I shouldn't take this oversight personally, but hey, I used to be a bicycle courier, so I do. British Cycling asserts that the wearing of a correctly fitted hard shell helmet conforming to a recognised safety standard is recommended for all of its non-competitive events. British Cycling also strongly recommends the use of such a helmet whilst cycling at all other times, whilst recognising the right of each individual to choose whether or not to accept this recommendation. Helmets are the subject of much debate, most of which is anecdotal (i.e. highly subjective and virtually impossible to verify – “my helmet saved my life”), and lot of which is emotional (e.g. the recent appeal by the father of Ryan Smith, a teenager left in a coma after a collision). I don't want to get into it too much. I said more or less what I think about helmets over here, and as a recent edition of More Or Less pointed out, not enough research has been done. However, there is good evidence that in jurisdictions where helmet use is compulsory that cycling rates have fallen after compulsion. It is also the case that use or non-use of a helmet is increasingly becoming a modifier used in legal proceedings to determine 'contributory negligence' by the cyclist, even in cases where the cyclist bore no responsibility for the collision that caused the injuries suffered by the cyclists. We have all enjoyed the interventions of Bradley Wiggins & Laura Trott in this area, but it's worth pointing out that both Wiggins & Trott are very much the creations of British Cycling, have been nurtured and developed by structures put into place by British Cycling and the downside of enjoying the glorification reflected from their respective medals is having to accept responsibility for the stupid things that they say, especially when what they said was only a paraphrase of British Cycling policy. Lastly, there's Eastway. It's long enough since the Eastway Cycle Circuit was bulldozed that a lot of Londoners will associate Eastway with a miserable road running across Hackney Marshes, through one of the most hostile and confusing road junctions in all of London, scene of the death of a cyclist during the Olympics, run over by an Olympic bus. But for older sporting London cyclists Eastway means a green oasis of cycle sport, built in the 1970s, and used pretty much 7 days a week through the summer for road-racing, mountain-biking (Eastway was the original venue for the Beastway races), time-trialling, BMX and cyclo-cross. Eastway Cycle Circuit was sacrificed by British Cycling on the Olympic altar, depriving London cycling of its best equipped venue for nearly 10 years. The organisation of the replacement facility, Hog Hill, was less than stream-lined, but hey, it was all worth it because we (London's sporting cyclists) are getting back a world-class sporting facility blah blah blah. I won't be the first to point out that cycling is getting back a lot less land than was taken away. Ok, there's a velodrome there as well, ok, ok. But the size of the site is much, much smaller. But how are we going to get to the Velopark, or whatever it's called? This is something that doesn't seem to have been considered very much, or at all, by British Cycling. Maybe they just assumed that people would do what they do when going to bike races elsewhere in the country, that is put their bikes and their kit in or on their car and drive. We have heard so much about the attention to detail of British Cycling, the 'marginal gains'. BC was apparently consulted about the velodrome at every step of the design and construction. To give one well-reported instance, there had been modifications to the design of the entrances to the velodrome to keep the ambient air temperature inside the building as warm as possible to facilitate quick times. Chris Hoy purred when the velodrome was presented to the public. I first started using Eastway Cycle Circuit before the M11 link road was built. I rode from Hackney. At that time, Eastway, the road that I used to access the cycle circuit, was pretty busy, and the right turn across 3 lanes of traffic was… well, it was a right turn across 3 lanes of fast moving traffic, albeit at a signalled junction. Not something to look forward to, but not something I couldn't handle, what with being able to ride reasonably quick and also a 'professional' road-user. Since then, the link road has been built, which has added a motorway intersection into the mix. This ramped up the speeds, and made the westbound turn off Eastway towards Hackney even more fun than it had been before. The Olympic Park has added an extra dimension of confusion to the road layout, which undoubtedly contributed to the death of Dan Harris. If I, an experienced cyclist who has been riding in London since the age of 2, gets confused by the road layout around the Velopark (or whatever it is called), what must it be like for less experienced cyclists? I don't use the A13 for anything really, so I can't really comment on how dangerous, relatively, the Eastway / A12 (M) / Olympic Park / Westfield interchange is compared to the notorious Barking interchange, or what the KSI numbers are. But I will say that it was pretty inappropriate for cycling before the M11 was built, and has only got worse and worse since. It has always been a road that I rode along as quickly as possible to minimise my exposure to the conditions. As far as I know, we didn't have any input into the route but we have heard the criticisms. My colleague in the Campaigns team has suggested that you contact the London Cycling Campaign on this. Hope this is helpful. In other words, they didn't raise the issue of whether people would cycle to the Velodrome, and how safe it might be for them to do that. This doesn't surprise me, as I have always found cycle sport to be a pastime for people with cars. I don't want to labour the point, but BC is trying to get more kids into cycling. The Velopark is virtually in Hackney. Hackney has very, very low rates of car ownership. It therefore follows that Hackney kids, if they aren't going to get the bus or walk, aren't going to get driven, so are likely to cycle to the Velopark. Honestly, I wouldn't want anyone's kids to have to negotiate the roads around the Velopark. At the Hackney Cycling Conference Andrew Gilligan said, in reference to the Mayor's (and TfL's) support of sporting cycling events, something like: I view the relationship of events like the Tour de France to everyday cycling as similar to the relationship of the Bluebell Railway to Eurostar. (Apologies to Mr Gilligan if I have mangled his metaphor). British Cycling's flagship facility in London is the Velopark. As it is, the Velopark could not be more isolated from the attempts of other interested parties (councils, TfL, the Mayor's Office, London Cycling Campaign etc etc) to build mass cycling in London. The Velopark is therefore the perfect illustration of the truth of Mr Gilligan's aphorism. If British Cycling wants a suggestion from a former member, former user of Eastway, London cyclist, I would shut up about 'cycle-proofing', get a grip on your athletes and stop them from blurting out nonsense, and do something to sort out safe routes for cyclists around the Velopark. I started blogging here about a year ago, and one of the first posts was about the Paris 0 deaths stat. This stat has turned out to be what Tim Harford and the More or Less production team call a ‘zombie statistic’, a number whose significance is either false, or grossly misinterpreted, but keeps coming rising from the dead, metaphorical hands outstretched to grasp reality and pull it back down into the miasma of half-truth and phoney assertions. My friend, colleague and fellow Moving Target contributer, Jon Day used it in a blog on the LRB site in July just past. Anyway, in a guest post, I asked Kieron Yates, possibly the original source of the offending statistic, and former Paris resident, to clarify. About eighteen months ago I was living in Paris and tweeted that there had been no cycle deaths in the city during the year 2011. It was a tweet that was picked up and retweeted by various London cycling campaigners and used to highlight how much it is possible to reduce urban cycling casualties. A 140 character tweet, however, does not provide much space for context. Since I was happy at the time to see the figure being used to take to task the willingness of politicians to make serious changes to transport infrastructure, I let the matter lie. I later did a piece with Jack Thurston on The Bike Show about cycling in Paris and this statistic came up again. I was able to clarify that, although the statistic is correct, it is not a simple case of comparing like with like. Most importantly, the figure of zero deaths in 2011 relates solely to the Ville de Paris, which is the inner heart of Paris. It is the area enclosed by the city’s périphérique ring road: an area slightly smaller than that covered by London Transport’s zones one and two. Recent statistics for the Ville de Paris show that the highest number of cycling fatalities was in 2009, when six cyclists died, a figure which possibly points to cycling in Paris being no safer than in central London. Typically, however the numbers are lower and average out at four cycling deaths a year. If one wants to draw wider comparisons between Paris and London with regard to cycle safety it is worth looking at accident statistics for the greater Paris area. The Ile de France is a largely urban agglomeration with a population larger than Greater London and occupying a larger area (12,012k m² compared to 1572 km²), here the number of cycling fatalities for 2011 and 2012 were 10 and 17 respectively. Some campaigners used the zero deaths statistic to highlight the importance of investment in infrastructure. It is true that the Ville de Paris has invested and continues to invest in cycling infrastructure but I personally do not believe that it possesses much that is greatly superior to what is available in London. There are segregated lanes in some places for the use of cycles, buses and taxis but they are not widespread and it is more usual to see streets with no segregation or a simple painted cycle lane. To me it seemed as though the best infrastructure was most visible in the places tourists tended to visit: around the Marais and the first arrondissement, Montmartre and eighteenth arrondissement. Elsewhere cycling infrastructure is often lot worse: I regularly left the city via the roundabout at the end of Avenue Foch in the sixteenth where, as with many other big intersections in Paris, traffic arrived unpredictably from every angle showing little consideration to the presence of cyclists. When I was pushed to think of a reason for the French statistics the major difference that came to my mind was the relative invisibility of large goods vehicles on the streets of Paris during daylight hours. HGV’s haven’t been banned from the Ville de Paris, there are however rules on when HGV’s can enter Paris. If a lorry has a surface area greater than 43m² it can’t enter Paris at all. If a vehicle is between 43m² and 29m² it can enter the city between 10pm and 7am. If it is less than 29m² entry is restricted to between 10pm and 5pm, in other words only excluded between 5pm and 10pm. Vehicles below 29m² using clean fuels have no restrictions as do car transporters which are generally very busy restocking car hire businesses. As an example of how this may work in London, I used to work at Waitrose in Marylebone High Street and their deliveries would, due to the size of the loading bay, have been on lorries less 29m². So, under the Paris regime, this branch of Waitrose would have been able to receive deliveries between 10 pm and 5 pm. Investment in cleaner LPG lorries would mean that this particular supermarket would have been able to re-stock at anytime of day or night. Current London road freight regulations mean that these vehicles can only deliver between 7am and 9pm, the period when London roads are most congested. My experience was that due to the unpredictability of traffic entering London, lorries would frequently arrive at the branch before 7am and wait outside the store with engine running to maintain refrigeration. This would disturb residents who lived in the flats above. The alternatives were to get the lorry onto the loading bay, which could be equally noisy, or make it wait on Marylebone Road. In Paris hauliers and larger storeowners have addressed the problem of noise pollution by introducing quieter refrigeration for delivery vehicles and by making night-time deliveries quieter in general. The investment is worthwhile as it is to their advantage to make deliveries at the least congested time of day. The Ville de Paris itself has entered into the spirit of quieter deliveries and collections by replacing its fleet of dustbin wagons with newer models running on liquid petroleum gas; these lorries also have a new lower cab design, easing access for operatives and improving all round visibility. One factor that makes this change in delivery handling possible is the huge difference in retail, particularly food retail, in Paris and London. Parisian supermarkets are generally smaller than their British counterparts: equivalent in size to the convenience stores of the big UK supermarkets. Where I lived in the west of Paris I had at least five supermarkets and four street markets within a kilometre of home. I’m now living in Lewisham and have two large supermarkets and one street market within a kilometre. Generally in London it is the consumer who pays in time for the final part of the journey from supermarket to the kitchen. Further cultural difference between the two cities is seen in the construction industry. Within the Ville de Paris building regulations are very strict. Most buildings get re-fitted and re-purposed rather than bulldozed and redeveloped. During my time in Paris at the end of the street where we lived there was a large apartment block. This block was converted into office space over a period of 18 months. I only saw large delivery vehicles in the early mornings. Small flat bed trucks, the kind local councils in the UK use for collecting old fridges and mattresses, removed most waste material. If I did see skip lorries around the site, the driver was always accompanied by a banksman whilst maneuvering on the public streets and the lorries themselves bore the logo and certification of Bureau Veritas an independent auditor of standards and compliance. Paris has been working on a reduction in use of large goods vehicles since 2006 with the aim of cutting pollution. Aside from the changes mentioned above other innovations include the use of electric tri-porteurs to transport small deliveries. Indeed one company has gone as far as arranging collections by barge from a depot on the outskirts of Paris, sorting deliveries on the barge as it makes its way to the centre of the city and then using tri-porteurs to deliver over the final kilometre. Elsewhere specially adapted tram carriages have been used for making deliveries overnight along the length of the newly developed tram system in eastern Paris. It is hard to make direct comparisons between London and Paris when it comes to cycling fatalities. A common sense part of me wants to believe that by ridding its streets, at peak commuting hours, of what have been identified as the most hazardous vehicles to cyclists, Paris has to a degree reduced its level of cyclist fatalities. The true picture is less clear however and cycle fatalities as a consequence of poor HGV maneuvering still occur. What is clear to me is that with vision and commitment it is possible to successfully alter the way our cities are serviced. The benefits of this change in Paris are a sustainable future, which makes full use of a city’s wider infrastructure allowing it to grow whilst retaining its unique character. If these changes introduced to cut pollution have resulted in fewer cycling fatalities then that has to be welcomed. For me what was most noticeable in the City of Light was how much more of the roads and space around them was visible in the relative absence of large goods vehicles.